This is my new ultimate skating breakfast: potatoes for carbs, tofu for protein. They're really delicious together, who knew. I got the potato-nuking trick from Easy Breakfast Potatoes and the tofu-squishing trick from The Ultimate Scrambled Tofu. But you could also use a little bit of whatever something-something you have on hand, like a bunch of parsley, chopped, or half a bell pepper, finely diced. Microwave the potatoes for just three minutes, then dice them. Heat oil in a saute pan over medium-high heat, then add potatoes and celery to the pan. Toss to coat potatoes in oil, then cover and cook for 10-15 minutes. Uncover and toss again, adding any herbs at this point, and cook for another 10-15 minutes until browned. 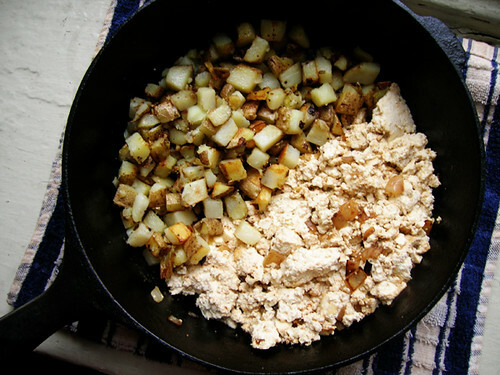 You can do this in a separate pan from the tofu, but I have this awesome cast iron pan that nothing sticks to; so now I set the potatoes aside and use the same pan for the tofu. I suppose you could scramble it all together, but I feel like the tofu would get the potatoes wet at this point. Heat oil in the pan over medium heat. Add onion and saute until slightly carmelized, about 5-10 minutes. Stir in soy sauce.